The hedgehog signalling pathway has been implicated in many different processes in fly and vertebrate development. It is now known that the hedgehog cascade is crucial for the patterning of the early respiratory system. Hedgehog signalling in the lung involves Gli transcription proteins, but their potential downstream target genes have yet to be identified. Bmp4 and Fgf10 have been shown to regulate lung branching morphogenesis but seem not to be targets of hedgehog signalling. During development, the mammalian lung establishes a large diffusible interface with the circulation to facilitate respiratory gas exchange at term. In the human, the appearance of a midventral groove in the single foregut tube just posterior to the pharynx at around the fourth week of human development is the first sign of lung formation. Next, the laryngo-tracheal groove deepens and finally constricts, thereby dividing the foregut tube into a ventral trachea and a dorsal esophagus. At the same time, the tracheal rudiment outgrowth elongates caudally and bifurcates to form two bronchial lung buds. In the mouse, the lung starts as a tracheal diverticulum in the ventral half of the primitive foregut, just anterior to the developing stomach at 9-9.5 days of gestation. The two lung buds elongate in a posterior-ventral direction. At the same time, starting at the primary branching point the single foregut tube begins to divide into two tubes, the dorsal esophagus and the ventral trachea. Subsequently, the primitive buds of the human and mouse lung rudiments continue to elongate into the splanchnic mesenchyme; outgrowth of these buds produces the left and right primary bronchi. During the next step, the primary bronchial buds divide asymmetrically, giving rise to two left and three right secondary bronchi in humans and one left and four right secondary bronchi in the mouse. Each secondary bronchus is a stem bronchus, which will be a lobar bronchus. These stem bronchi are destined to branch and rebranch and, with the surrounding pulmonary mesenchyme (which will provide the elastic tissue, smooth muscles, cartilage, vascular system and other connective tissues), will give origin to the definitive pulmonary lobes that characterize adult lung organization. Branching of the lung buds is controlled by epithelial-mesenchymal tissue interactions. The mesenchymal component defines the branching pattern of the epithelium. However, the question is: What controls the sequence of dorsal-ventral, lateral and left-right budding and branching in the lung? Candidates for the answer to this question are morphogens and growth factors. Morphogens are defined as molecules that diffuse away from their source and give positional information to surrounding cells on the basis of their local concentrations. A candidate morphogen might be the secreted signalling molecule Sonic hedgehog (Shh), a vertebrate homolog of hedgehog (Hh) in Drosophila. In the fly, Hh signalling patterns the segment, leg, wing, eye and brain [1, 2]. Hh is a secreted molecule that undergoes autocatalytic cleavage to give an active N-terminal fragment, which is modified by the addition of a cholesterol moiety at its C terminus . In contrast with the single Hh in flies, vertebrates have at least three Hh homologs: Sonic (Shh), Desert (Dhh) and Indian (Ihh). Shh is the most extensively studied of the vertebrate Hh genes and has been shown to be responsible for patterning many developing organs, including the lung [4**,5**]. Dhh and Ihh have more restricted roles and are primarily involved in the development of the germline and the skeletal system, respectively. Genetic and biochemical analyses in flies and vertebrates have led to a Hh signalling pathway that has been conserved from flies through to humans (Fig. 1). Hh binds to patched (Ptc), a transmembrane protein, which inhibits the activity of smoothened (Smo), another transmembrane protein, which has some resemblance to the large family of G protein receptors (2). 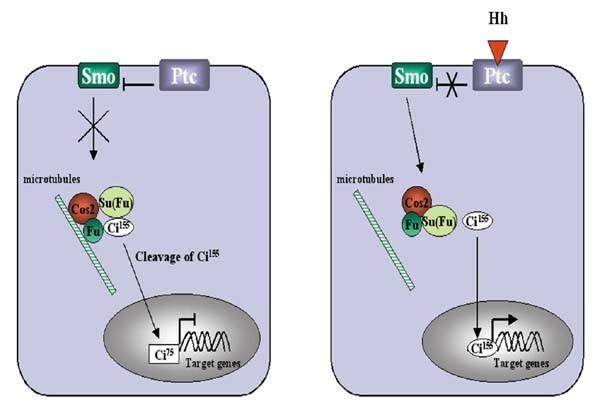 On Hh binding, the repression of Smo by Ptc is released, leading to the activation of cubitus interruptus (Ci). In the absence of Hh, full-length 155 kDa Ci, which forms a complex with several segment polarity proteins (fused, costal-2 and suppressor of fused) at the microtubules, is cleaved to release a transcriptional repressing 75 kDa N-terminal fragment. When cells bind Hh, cleavage is prevented, the microtubule complex is dissociated and the activation of target genes results . At present three vertebrate Ci genes, gli 1, 2 and 3, have been identified but their exact role in the activation and repression of Hh target genes remains to be elucidated. The Hh signalling pathway, based on what is known in flies. In the absence of Hh, Ptc inhibits signalling from Smo. Full-length Ci is cleaved after forming a microtubule complex with several segment polarity genes (fused, costal-2 and suppressor of fused) and the 75 kDa Ci product act as a transcriptional repressor protein. On the binding of Hh to Ptc, the inhibitory effect on Smo is released, leading to the dissociation of the microtubule complex. Ci cleavage is prevented and Ci activates the transcription of target genes. In the developing mouse lung, shh expression is detected in the tracheal diverticulum, the esophagus and later in the trachea and lung endoderm [4**]. The gene shh is expressed at low levels throughout the epithelium with higher levels in the growing distal buds [7–9]. The total amount of pulmonary shh mRNA expression declines towards birth . Shh-null mutant (shh -/-) mice exhibit serious foregut defects [4**,5**]. The trachea and esophagus do not separate into distinct tubes, and both hypoplastic lung buds appear as single lobes. Both single lobes have sac-like structures instead of an extensive network of air sacs and when cultured for 5 days there is no sign of epithelial branching or mesenchymal proliferation. Surprisingly, proximal-distal differentiation of lung epithelium was normal in shh -/- mice [5**], indicating that Shh is important for branching morphogenesis but not for proximal-distal differentiation. In situ hybridization studies showed that mesenchymal ptc, gli1 and gli3 expression were downregulated in the shh -/- mice. Overexpression of Shh, with the use of the SP-C enhancer/promoter, resulted in the absence of functional alveoli and an increase in interstitial tissue caused by an increased proliferation of both epithelial and mesenchymal cells . Transgenic pups die soon after birth, probably owing to respiratory failure. Cell differentiation, as assessed by the expression of SP-A, SP-B and SP-C and CC10 mRNA, was normal in Shh-overexpressing mice lungs. In accord with the decrease in the expression of pulmonary ptc in the absence of Shh, ptc mRNA is increased in Shh-overexpressing lungs. These results indicate a role for Shh signalling in pulmonary branching morphogenesis in mice. In addition, there also seems to be a role for Shh in establishing asymmetry between left and right lungs [10, 11] and in the process of separating trachea and esophagus. Ptc is a multipass membrane protein that functions as a Shh receptor. A clear function of Ptc is the regulation of Shh target gene transcription. Ptc represses the transcription of genes that are induced by Shh , including gli1 and ptc-1. This repression is released on Shh binding. Ptc-1-null mutant mice die between embryonic days 9.0 and 10.5 with neural and cardiac defects , just at the time that lung formation begins. In the lung, ptc is expressed at high levels in the mesenchyme adjacent to the terminal buds where shh is normally expressed [4**,8]. It is also expressed at low levels in the distal epithelium. Ptc mRNA levels, like shh, decline towards birth . Ptc is upregulated in lungs that overexpress Shh [8, 13], whereas ptc is downregulated in the lung mesenchyme of shh -/- mice, indicating a positive feedback mechanism between shh and ptc expression [4, 5]. In mice, three zinc-finger transcription factors, Gli1, Gli2 and Gli3, have been implicated in the transduction of the Shh signal. All three gli genes are expressed in lung mesoderm rather than endoderm and all three are expressed at higher levels in distal mesoderm than in proximal mesoderm . Expression levels of all three genes decline when development proceeds. Overexpression of Shh in the lung resulted in an upregulation of gli1 expression, whereas gli2 and gli3 expression remained unaltered . It is thought that, in developing limbs, Gli3 is a repressor of the Shh signalling pathway . Whether this also holds for lung development is unclear: Gli3-deficient mice are viable, but the lungs are smaller and the lobes are changed in shape . Gli3-deficient mice did not reveal any difference in the expression of genes that are involved in the Shh signalling pathway, such as shh, ptc, gli1 and gli2. This suggests that Gli3 is not important for lung development on its own, but it might have a function in compensating for other Gli proteins. In contrast with the mild phenotype in gli3 -/- mutants, gli2-null mutants die at birth with severe skeletal and neural defects. The right and left lung in gli2 -/- mutant mice appear together as a single lobe reduced in size, and the primary branching in the right lung is defective [15**]. Trachea and esophagus are hypoplastic but do separate. SP-C and CC10 mRNA expression is not different, indicating normal terminal differentiation. Proliferation in the mesenchyme is reduced in gli2 -/- mice. This gli2 -/- phenotype is very similar to that of Shh-deficient mice, with the exception that in shh -/-mutants the trachea and esophagus fail to separate, whereas separation occurs in gli2 -/- mice. Shh gene expression was not affected in gli2 -/- mouse lung, although ptc and gli1 expression were downregulated [15**]. In gli2 -/-;gli3 -/+ double mutants, the trachea and esophagus do not separate and the lung is hypoplastic, with no separation into left and right lobes. Instead, the gli2 -/-;gli3 -/+ mutant lung consists of a single lobe. Gli2 -/-;gli3 -/- double mutants die at about embryonic day 10.5 with no trachea, esophagus or lung. This indicates that Gli3 is important for foregut formation when other Gli proteins are missing, because one allele of the gene rescues the formation of a fused trachea and esophagus instead of no foregut at all. Gli1 -/-mutants are viable and appear normal [16*]. Most gli1 -/-;gli2 -/+ double mutants die soon after birth with multiple defects and smaller lungs. Gli1 -/+;gli2 -/- mutants have smaller lungs than gli2 -/- mice, but they do form two lung buds. Lung lobes of gli1 -/+;gli2 -/+ appear normal, whereas gli1 -/-;gli2 -/+ compound mice have only a slight reduction in the accessory lobe. Gli1 -/-;gli2 -/-mutants have two very small lobes, but with branching. These findings suggest that Gli1 and Gli2 have overlapping functions during early development of the lung. Shh -/- mice have four tiny lobes, without branching [4**,5**]. Because gli1 and 3 are down-regulated in Shh -/- mice, these results taken together imply that Gli2 is important in the asymmetric pattern formation of the lung. There is substantial evidence that, in Drosophila, Hh regulates the expression of Decapentaplegic (dpp), the Drosophila counterpart of bone morphogenetic proteins (Bmp) and Wingless (wg), a member of the Wnt family of signalling molecules. Bmp4 is a member of the transforming growth factor-β superfamily, closely related to Drosophila Dpp. The bmp4 expression pattern is very similar to that of shh in the lung, with high expression levels in the developing distal lung tips . However, bmp4 is also expressed in the adjacent mesenchyme, whereas shh seems to be confined to epithelial cells. Overexpression of Bmp4 in the distal lung epithelium resulted in smaller lungs with less epithelial branching and fewer, dilated airsacs . In situ hybridization revealed less SP-C expression, whereas CC10 expression was normal. No difference was seen in the expression of shh. Moreover, the overexpression of Shh in the distal lung epithelium results in a different phenotype from that of Bmp4 overexpression, and there is no major difference in the level and pattern of bmp4 expression in shh-null mutants [4**,5**]. These results make it less likely that Bmp4 is a direct mesenchymal target for Shh during mouse lung development. Bmp4-deficient mice die between embryonic days 6.5 and 9.5 , which is long before the formation of lung buds; it is therefore not possible to evaluate a role for Bmp4 in early lung development from this knockout model. However, ectopic expression of the Bmp antagonist Noggin throughout the distal lung epithelium with the SP-C enhancer/promoter resulted in a decrease in distal epithelial cell types and a concurrent increase in proximal cell types [18*]. This indicates a role for Bmp4 in controlling the proximal-distal differentiation of endoderm in lung development. The observation that there was no difference in the expression pattern or level of shh in this inhibitory model of Bmp4 function also argues against a direct interaction between Shh and Bmp4 during lung development. Fibroblast growth factors (Fgf) are important in many developmental processes, and genetic analyses in fruit-flies have demonstrated that the fly gene for Fgf (branch-less) and its receptor (breathless) are essential for the branching of the Drosophila tracheal respiratory system . Within the Fgf family, Fgf10 seems so far to be the most interesting when it comes to mammalian lung development. The importance of Fgf10 for lung development became clear when fgf10-null mutants were generated: these died at birth with severe lung and limb defects [20**,21**]. In normal lung development, fgf10 is already expressed in the mesenchyme surrounding the two small lung buds at embryonic day 9.5 . Northern blot analysis revealed that the total amount of fgf10 mRNA increases towards birth, whereas the expression stays restricted to the distal mesenchyme, surrounding forming lung buds. A zone of cells lacking fgf10 expression at the distal tips develops only later, as the terminal bud undergoes dichotomous branching. In fgf10-null mutants, the trachea develops but the right and left primary lung buds do not form. The `buds' appear as a disorganized mesenchymal mass at the distal end of the trachea, with no expression of shh, wnt2 or bmp4 [20**]. A similar phenotype developed when fgfr2, encoding the putative Fgf10 receptor, was knocked out . However, Fgfr2 can also bind Fgf7 and, in vitro, the latter has been shown to be involved in lung branching . Surprisingly the fgf7-null mutant did not show a lung phenotype , indicating that Fgf7 function in lung development can be compensated for by other Fgfs or it is simply not an essential factor for early development. Whether Fgf10 is the mammalian homolog of Drosophila branchless remains to be established. In addition, it is unclear whether Fgf10 is a target gene for Shh. fgf10 has been shown in vitro to be upregulated in murine lung mesenchymal cells cultured without epithelial cells, whereas the addition of Shh to these cells prevented the increase in Fgf10. In contrast, when Fgf10-containing beads were implanted in lung explants from embryonic day 11.5, shh expression did not change . Furthermore, because fgf10 expression is downregulated in lungs that overexpress Shh , and fgf10 expression increases towards birth, while shh decreases, Shh might interact negatively with Fgf10 during the process of lung development. However, genetic analysis suggests that Fgf10 acts upstream of Shh in branching because no lung buds develop in fgf10 -/- mutants, whereas they do form in shh -/-mutants. Furthermore, fgf10 -/- mutants do develop a separate trachea and esophagus, whereas a shh-null mutant exhibits esophageal atresia/stenosis and tracheo-esophageal fistula. Thus, it seems more likely that Shh and Fgf10 function in separate but parallel pathways during early lung development. It is evident that the Shh/ptc/smo/gli pathway is important in early pattern formation in the lung (Fig. 2). 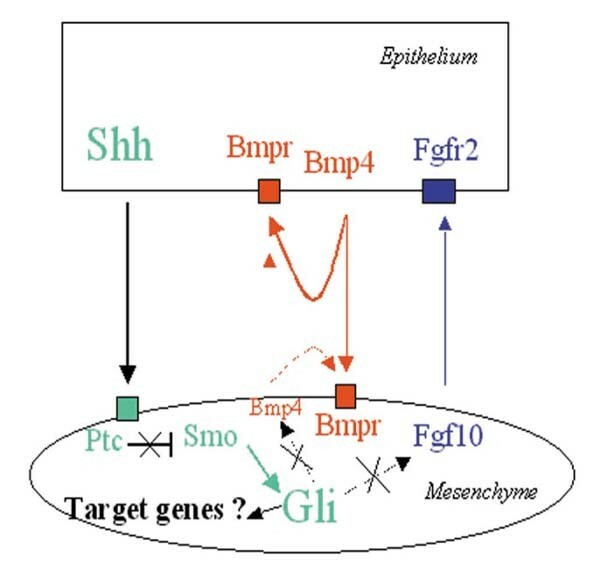 Bmp4 and Fgf10, which are both implicated in mammalian lung development, seem not to be regulated by Shh signalling in the developing lung (Fig. 2). To understand Shh signalling during lung development, the identification of novel downstream target genes is needed. Newly identified targets are hip (hedgehog interacting protein), a membrane glycoprotein, which seems to be a negative regulator of Hh signalling , and a member of SOCS (suppressor of cytokine signalling)-box WD proteins, SWip1, which is one of the earliest markers to respond to Shh in the limb . It needs to be established whether these molecules are present in the lung. Because wingless is a downstream target of Drosophila Hh signalling, further investigations into the role of wnt genes in lung development are warranted. Schematic model of Shh/Fgf10/Bmp4 signalling during lung branching morphogenesis. Shh is produced and secreted by epithelium in tips of growing buds, binds Ptc in the mesenchyme and releases Smo function, which then results in the activation of the Gli2 and Gli3 transcription factors (green). Bmp4 and Fgf10 seem not to be target genes of Gli2 and Gli3. Fgf10 is elaborated by the mesenchyme overlaying the tips of the epithelial buds, and binds and activates Fgfr2 in the epithelium, which then results in a chemotactic and mitogenic response (blue). Bmp4 is expressed in the epithelium of the growing buds but also weakly in the adjacent mesenchyme. It is secreted and acts on Bmpr present in both mesenchyme and epithelium (red). The work of the authors is supported by the Medical Research Council of Canada.